NC254 paste flux is a mildly activated, resin-based formulation developed to offer a broad process window and pin-probeable residues. The superior wetting ability of NC254 results in bright, smooth, shiny, solder joints. NC254 offers very low post process residues, which remain crystal clear and probable even at the elevated temperatures required for today's lead free alloys. NC254 has shown to reduce or eliminate voiding under micro- BGAs. NC254 also offers high humidity tolerance and a chemistry developed for use in air reflow. This material has been utilized on various assemblies with RF designs without cleaning; however, the compatibility of flux residues on RF assemblies is strongly dependent upon circuitry design. B-NC-254-1 NC 254 No Clean Paste Flux, one 10cc syringe 1x10cc syr. B-NC-254-10 NC 254 No Clean Paste Flux, 10x10cc syringes 10x10cc syr. B-NC-254-25 NC 254 No Clean Paste Flux, 25x10cc syringes 25x10cc syr. B-NC-254-100 NC 254 No Clean Paste Flux, 100x10cc syringes 100x10cc syr. 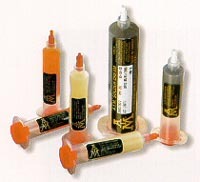 XRF-10A Lead Free Rework Paste Flux in 10cc syringes for use with manual plungers or auto dispensers.